Corner Shed, Offers & Deals, Who has the Best Right Now? Looking for a corner shed? At WhatShed we know just how time consuming and confusing it can be when it comes to choosing the right corner shed. 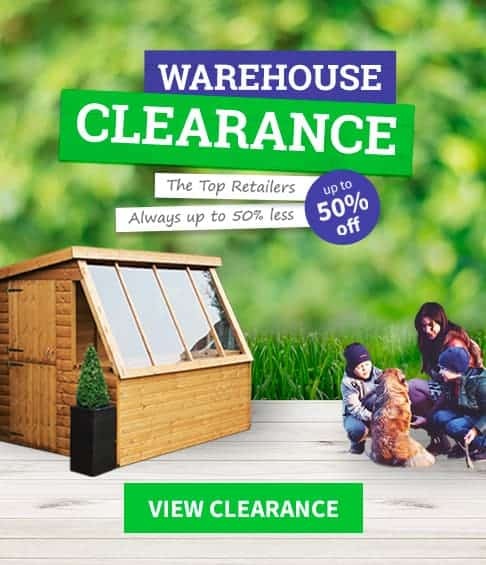 That’s why we’ve spent hours reviewing the different corner sheds available from the UK’s top 10 retailers to come up with a list of the top 10. Our number one spot goes to the outstanding Rushton 9’x9’ Rutland Five Sided Corner Shed. Not only is this one of the most attractive corner sheds we’ve come across, but it also benefits from being one of the largest on the market. At 9’ x 9’ you are getting an excellent amount of interior space. The sensational 15mm thick tongue and groove clad floor also means you get to store heavy items in here too such as workshop machinery. This is one solid and spacious corner shed! It’s not unusual to come across a Shiplap tongue and groove clad corner shed, but what is unique to this particular model is the thickness of the walls. Measuring 15mm thick, you are provided with an exceptionally durable shed that is guaranteed to last decades. Its single door design is also unique as most tend to come with double doors. You would think this would lower its appeal, but you’re still given a large spacious access point, along with a more characteristic look. This shed looks more like a miniature house than a storage space. There are many reasons why this incredible corner shed has made it onto our list. Firstly it has a very attractive and modern design. If you take a look at the double doors for example, you’ll see they have a framed design. Helping to make them a focal point of the building, this framed look adds a more defined style. The roof also has a very slight overhang which also adds to its visual appeal. The quality of the corner shed is also a stand-out feature, with premium Shiplap used on its exterior and reliable solid sheet throughout the interior, helping to keep costs down. We’re surprised this is available at such a low price and it is by far one of the best budget corner sheds we’ve come across. It’s surprising just how many features this affordable corner shed comes with. 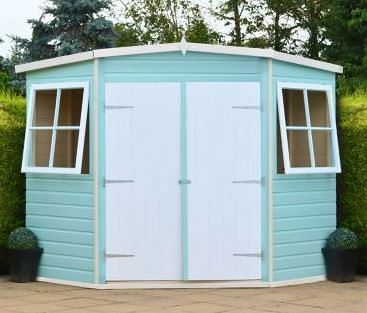 The Windsor 7’x7’ Corner Shed makes it onto the list for its incredible value. It is also one of the most popular corner sheds on the market, available from several different retailers. The double doors are splayed to the corner, offering great space saving benefits which is exactly what you want with a corner shed. The interior boasts substantial space to store everything from garden rakes and wheelbarrows to medium size machinery. 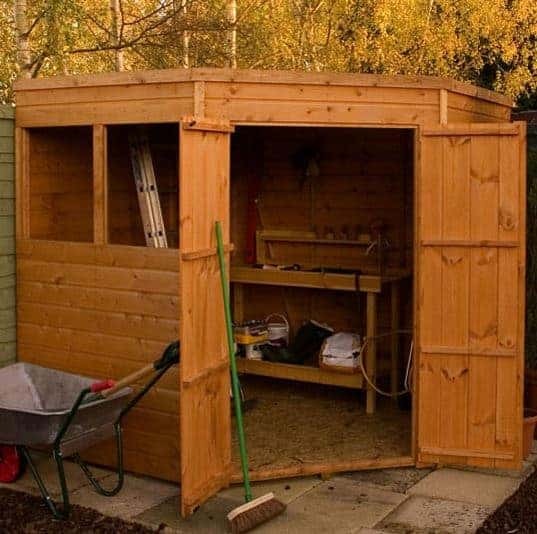 No matter what your storage needs, you should find this shed fits them perfectly. We also love the aesthetic style of the corner shed. With two fixed windows to the side, it offers a slightly unique look that you won’t find on any other corner shed. We’re so impressed by the Corner Pent Shiplap Wooden Shed from B&Q that we felt we should add the smaller and larger variations to this list. 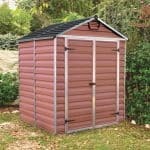 If you don’t have the space for the large 10’x10’ corner shed model, this one is ideal. It features the more common and compact 7’x7’ size and comes at a fantastically low price. It makes it onto our list for its exceptional value combined with a great selection of features. The opening windows for example are one of its major advantage points and are not something you typically see in corner sheds. Allowing you to filter air throughout the building, it prevents problems with mould and also makes it a lot comfier to use on summer days. We love the solid, strong Shiplap tongue and groove construction. It means this shed doesn’t just look good, but it performs well against the elements. Overall it is a high quality shed offering outstanding value for money. Overall an excellent value corner shed, solid, affordable and a real winner in our books. 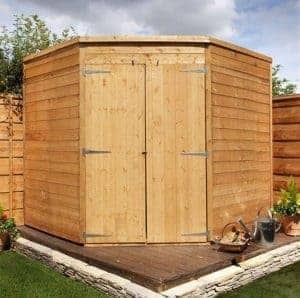 Here is the larger cousin of the previous entry and is ideal for when you have a lot of storage available but you don’t have a lot of space in the garden, this 10’x10’ corner shed from B&Q is highly recommended. 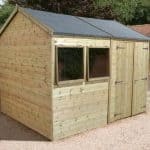 Making it onto the list for its sheer size and durability, this great quality shed is great not just for storage, but it would also make an excellent spacious workspace. Another thing we really rate with this corner shed is the opening windows. This is quite a unique feature as the majority of corner sheds come with fixed windows. Essentially what it means is you can get adequate ventilation throughout the shed in hot weather, making it a lot more comfortable to use. A fantastic selection for those looking for a larger more airy corner shed. This is an alternative to the windowless model featured at number 10 on our list. With four large wide view windows, we’ve chosen this for its potential to be used as a workshop. As plenty of light filters into the building, you’ll easily be able to see what you’re working on without the need to buy an outdoor building light source. You get the same great customisation options as the other one, with a wide choice of colour finishes available. Whilst it does take up very limited space in the garden, it offers a dominant, charismatic design that will look great in any corner. It is one of the higher quality corner sheds available, yet it still comes at a really affordable cost. Overall a fantastic corner shed for those looking for a little more flexibility with their selection. Let’s face it, one of the most infuriating things about buying a corner shed is putting it together. 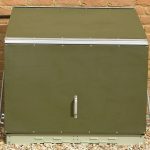 That’s why we were impressed to find that this 7’x7’ corner shed doesn’t just offer a solid and attractive design, but it also comes with a free installation service (well it’s included with the price). We’ve added this model for those who want to simply buy a corner shed and then use it without the stress of trying to install it. However, that isn’t the only thing it has going for it. A planed timber finish gives the corner shed a smooth, stylish appearance. Its panelled windows are also unique in that they are made from glass rather than styrene, offering more insulation inside the building. They also really add to its visual appeal, giving it a lot more character than the average corner shed. Overall a fantastic selection for those looking for a hassle free corner shed. 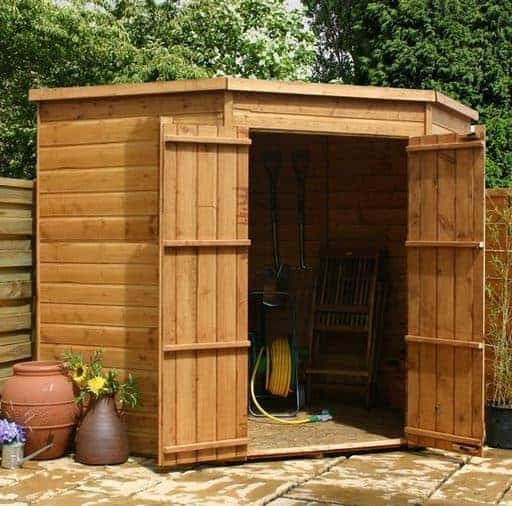 You are just a few clicks away from having a perfect corner shed suddenly appear in your garden with this selection. One thing you’ll notice when looking for corner sheds is the majority tend to come in 7’ x 7’ size. This Strongman Shiplap corner shed however measures 8’ x 8’. That combined with its extraordinary Shiplap design puts it in our top 10 list. Its size means you can use it as a general storage solution or even a good sized workshop. Its solid construction doesn’t just mean it will last for many years; it also offers more weather protection and security. Only FSC certified timber has been used and what we really like is you have the option to spend a little more to personalise the colour of the shed with Protek wood protectors. You will need to apply this yourself but there is an outstanding choice of colours available including the very bold Cranberry Crush and Violet variations. Overall a good value corner shed with real green credentials. 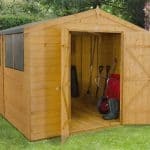 Waltons has become known for its range of top quality yet affordable sheds and this 7’x7’ corner shed is a fine example. Created with 12mm Shiplap tongue and groove cladding, this one makes it onto the list for its attractive, practical design. Visually it looks a lot different to your standard corner shed. We especially like that you can place it at a variety of angles too. We’re also impressed by the opening width of the doors. They offer incredibly spacious access into the shed, making it really convenient to use. It does come with two fairly large windows. You’ll find these not only add to the visual appeal of the shed, but the styrene glazing makes it a safe choice for those with young children. It’s also the perfect choice for gardens with various height restrictions thanks to its sloping pent roof. Combine this with an extraordinarily low price tag and you have one of the best, most attractive and convenient corner sheds on the market. Again for the price we really feel this is a steal. BillyOh is one of the leading manufacturers of garden sheds so it’s not surprising the brands corner shed has made it into our top 10 list. 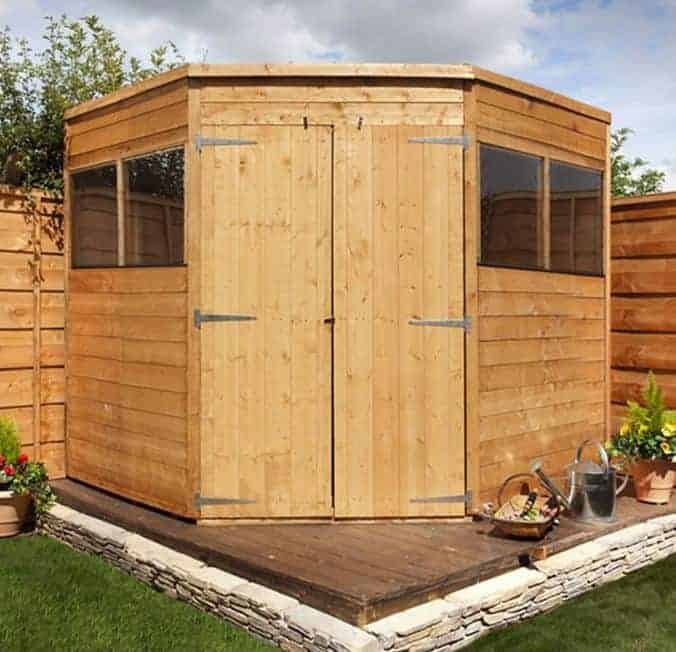 The 5000 Windowless Gardeners Corner Premium Tongue and Groove Shed is one of the most secure, high quality corner sheds available. It’s tough, durable and private design is what has elevated it onto the list. We particularly like its strong tongue and groove construction which features not just on the exterior of the shed, but throughout the interior too. 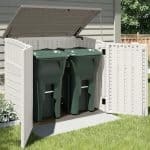 This makes it automatically suitable for heavier storage and was quite nice to see on a corner shed in this price range. 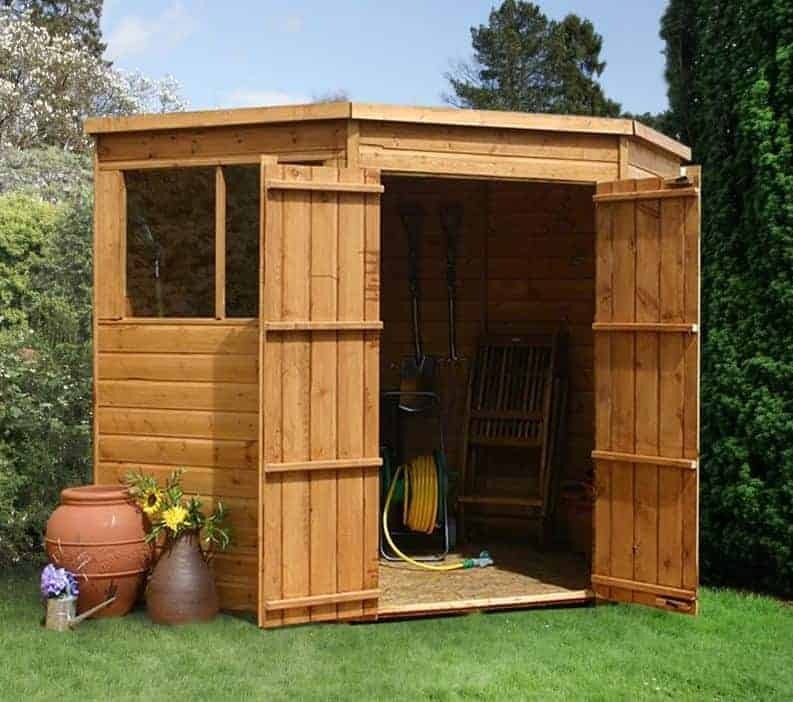 It’s got quite a spacious interior too for a 7’ x 7’ corner shed making it suitable for all kinds of equipment and garden furniture. It isn’t just the premium quality build that has impressed us with this model. You also have a couple of fantastic customisation options. This is actually one of the few corner sheds which allows you to alter its overall appearance. You can choose from three different trim colours and an outstanding twelve different colours for the walls. 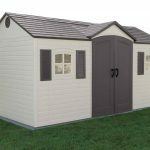 So if you’re looking for a shed you can personalise, as well as one that offers great value for money then this is a fantastic model to opt for. Overall a fantastic corner shed for the money.